Summer is setting in, and as Americans scramble to book last-minute vacations, the obvious beach destinations in states such as California and Florida, home to 17 of the country’s most popular 25 beaches, are likely to have a dwindling number of accommodations remaining. Thankfully, the country is full of smaller, more intimate beach towns, where tourist traps and crowded shores are substituted with local flair and peaceful atmospheres. Some of these spots are hidden far away from the obvious oceanside destinations, while others have are overshadowed by nearby tourist havens. Whether you’re looking for a beach with more originality, or simply trying to beat the crowds, here are five of the most underrated beach towns in America. 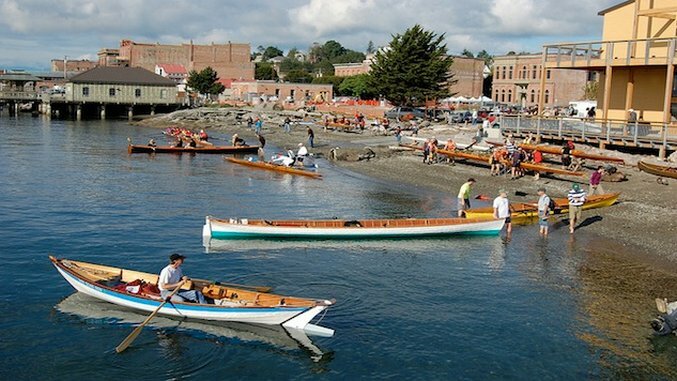 Located on Washington’s Olympic Peninsula and often more accessible by ferry than by car, Port Townsend enjoys relative isolation from the nearby metropolitan areas of Seattle and Vancouver. The town’s beauty lies in its Victorian-style architecture … a reminder of its late-1800s heyday, when Port Townsend was meant to become the New York of the West. Today, many of these homes are available for rental, or have been converted into Bed & Breakfasts. The small town also features a surprisingly vibrant downtown area, littered with art galleries, local crafts shops and restaurants of every genre. Both the beaches and downtown offer visitors incredible views of Puget Sound, while a look in the other direction can often include a clear sighting of Mount Olympia. For those looking to get closer to the mountain, Olympic National is no more than an hour drive away. Even though Gloucester served as the location for the 2000 movie The Perfect Storm, the northeastern town has more to offer than a chance to spend the night in the bar where George Clooney and his shipmates spent their free time. The town’s beaches feature scenic, rocky areas and more practical, sandier spots, most of which are within shouting distance of affordable, rentable beach houses. As Gloucester has historically been a deep-sea fishing hub, its seafood is hard to beat, and highly-rated restaurants serving up haddock, shrimp, lobster and other options are scattered across the small town. In terms of sightseeing, Gloucester can easily go toe-to-toe with larger beachside destinations. The town features a number of picturesque lighthouses, as well as Hammond Castle, a medieval-style castle and museum built in the early 1900s. Self-described as part of the “before Disney” version of Florida, Cedar Key moves at a slower pace than most of the state’s largest vacation spots. The island, with a total size of 2.1 square miles doesn’t just talk a big game about its small-town feel either, as its population barely exceeds 700 permanent residents. Just as in most seaside Florida towns, Cedar Key is in no short supply of sandy, flat beaches perfect for sun soaking or swimming in the warm Gulf waters. Additionally, the island’s small size ensures that no matter what lodging you chose, you’re bound to be near the water. Despite its easily accessible beaches, Cedar Key’s small, charming downtown may be its biggest highlight—the golf cart-filled streets are walled with colorful murals, preserved buildings and seafood restaurants. The town is also known as a fishing and bird watching haven, providing visitors with activities fitting to the island’s unhurried disposition. If it weren’t for the tall evergreens and moderate temperatures, it would be pretty easy to mistake Pentwater’s Lake Michigan shoreline for those of the Gulf or Atlantic. The town’s beaches are spacious and flat with white sands and soft waves, fitting the ideal mold for a traditional summer vacation. Although Pentwater is small—population is around 850 during the offseason—summer crowds from across the Midwest make for more congested beaches than those of the other destinations on this list. Regardless, a compact, restaurant-filled downtown, a summer calendar full of local festivals and events and a selection of homey Bed & Breakfasts give Pentwater a small-town vibe even during its peak season. Nearby, vacationers can find Silver Lake State Park, which offers camping, four miles of beaches and tours of the park’s famous sand dunes. From Pentwater, the park is only half an hour away, making it ideal for day trips. Between its simple pier, its privacy-providing cove and its small, centralized downtown, Cayucos feels like a true old-school surf town —minus the typical California crowds. Situated almost exactly between Los Angeles and San Francisco, this oceanside town has made its name for itself by keeping its distance from the chaos of the state’s more conveniently-located beaches. The vast and uncongested beaches of Estero Bay make surfing a huge draw, although the town also offers more traditional entertainment such as kayaking, hiking and fishing. In addition, the town’s proximity to other nearby activities makes it a solid base of operations from which to explore California’s entire central coast. Vacationers staying in Cayucos can find the breathtaking views of Estero Bluffs State Park just a few miles to the north. There are also dozens of wineries less than 30 miles away from Cayucos, as well as the town’s own beachside winery, Cayucos Cellars. Dillon Thompson is a freelance travel writer based in Athens, Georgia.